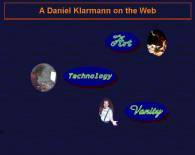 I began writing web sites in early 1995, using a book about the proposed HTML 2.0 standard, and a copy of Netscape 2.0 that cost $35. Back then, we had to manually install the TCPIP stack on our computers and but a browser to see the hundreds of thousands of web sites out there. 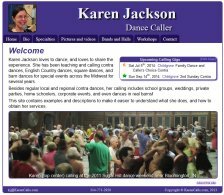 (2012-present): My wife decided to go regional with her folk dance calling, so I set up a simple web site to help her eplain what she does to prosepctive clients. This was my first foray into PHP, a direct descendent of Perl but easier to use for web sites. 2004-2013: HICI-Shopper and the associated family of web sites were inherited shopping sites that needed a lot of work to bring up to HTML4 standards. These sites ran profitably for a decade, but then we decided to retire them. 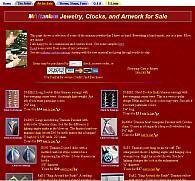 The URL's are for sale. They were built largely in ASP with HTML, SSI, CSS, and VBScript using an Access database. I converted it to MySQL and wrote the shopping cart system from scratch. Credit card acceptance was provided via a secure 3rd party service and is transparent to the user. I brought it up to Netscape compatibility (HTML 4.1 minimum), and added tools (pages) to simplify data maintenance. 2004-present: Stop and Go Tires was once part of the patio and birdfeeder empire above, but now it has a new owner, and I am still tweaking the site on occasion. Credit card acceptance was provided via a secure 3rd party service and is transparent to the user. 2003-present: Significantly revised the existing www.NetworkSalesInc.com web site. 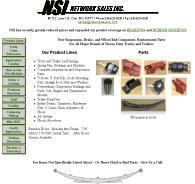 NSI distributes suspension components and systems for heavy trucks, tractors and trailers. I updated the look, a little. The most significant contribution was the addition of an ASP shopping cart, a simple-to-use cross-reference form to find parts using part numbers from manufacturers and other distributors, and support pages to allow users to find and order parts by picking from a short list selected by Original Manufacturer, type of part, etc. This set of pages uses the PayPal money service for Credit Cards and direct payments. I also provide a self-totalling fill-print-and-mail order form for checks and money orders. It was originally designed for widest compatibility and fast loading. I've kept it simple and fast. 1995-present: The FolkFire Calendar Page. was originally generated by Visual Basic from an MDB/Jet database. I ported it to Access 97 in 1997. Finally, I moved it onto the web server and generate the html from a tab-delimited data file using Perl/CGI. I'm still using a homemade Perl flat-file database editor to maintain the events. In 2012 I decomissioned the page for a number of reasons. First, it was a lot of work trying to get information out of the groups we were trying to help. Secondly, with pervasive Google now anyone can find evnets that are listed by date range and region. I simply wasn't worth the hassle. 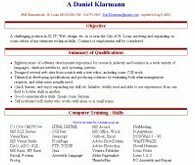 Visit this page to see more about my technical background, experience, skills, etc. 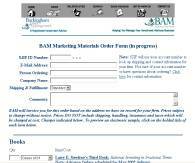 May 2002: A utility for Buckingham Assets Management Unless you are a BAM client, you can't actually view this page. I selected and specified the server type (Win2k, for a change) and researched and selected third-party add-ons, designed an SQL database for the 4 dimensional financial data, ported the un-normalized data from flat sources, developed a suite of form-driven ASP pages to extract, calculate, and generate views of the data as graphs and pivot tables. All ASP developed in a text editor, the SQL was prototyped in MS Access. One notable feature I designed is the client-side albums order form, which automatically sums and calculates shipping and taxes. It loosely encrypted credit card information to submit orders, thereby avoiding monthly fees for secure servers or cgi access. Russ Anderson singer/songwriter. I designed his site originally. Then I trained him to maintain and update it himself. He is also using my client-side self-totalling and encrypting order form. St. Louis Metro Polka Club is hosted under FolkFire, as was the Graces site originally. I designed a very simple site with all the pertinent information.